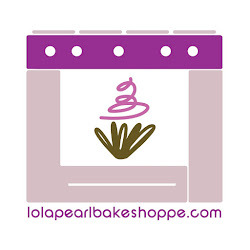 Lola Pearl Bake Shoppe: Bake Me A Christmas: Chocolate covered pretzels! Make these as a gift or a last-minute holiday party! 1. Place the chocolate wafers in a microwave-safe bowl. 2. Microwave at 30 second intervals on medium heat. Stirring in between. 3. 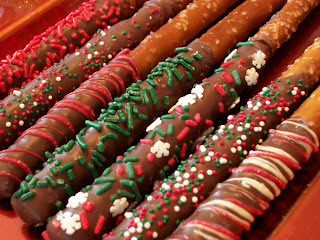 Dip pretzel rod halfway in chocolate. 4. If sprinkling, be sure to toss sprinkles on while chocolate is wet (during first 3 minutes). 5. Melt colored wafers in the same way. 6. Flip the pastry bag inside out and fill with the melted colored wafers. 8. Moving from on side to side, squeeze lines onto the pretzel rods.